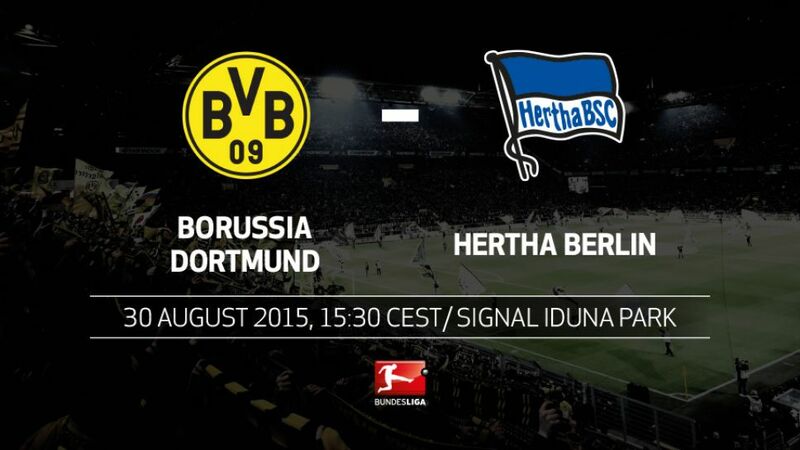 Dortmund - Fresh from securing their place in the UEFA Europa League group stages during the week, Thomas Tuchel's high-flying Borussia Dortmund are looking to continue their perfect start to the 2015/16 season with victory at home to Hertha Berlin on Sunday (kick-off 15:30 CEST / 13:30 GMT). BVB have been rampant so far, following up their 4-0 victory over Borussia Mönchengladbach on Matchday 1 with a 4-0 hammering of FC Ingolstadt last weekend, with attackers Marco Reus, Pierre-Emerick Aubameyang and Henrikh MKhitaryan in irresistible form. Hertha have also started the campaign brightly, however, and are likewise unbeaten thanks to a 1-0 triumph over FC Augsburg and last week's 1-1 draw with SV Werder Bremen. Dortmund have scored eight goals without conceding in the Bundesliga so far this season and their tally of six points puts them top of the standings for the first time since Matchday 7 in 2013/14. Hertha could only draw 1-1 with Werder Bremen on Matchday 2. If they had won it would have been the first time in the club’s history that they had triumphed in the first two Bundesliga matches of a season. Dortmund are the only Bundesliga side not to concede at all this term. Furthermore, no other club has scored as many as their eight goals yet. Since summer 2006, Dortmund’s results at home against Hertha have not been overly positive: two wins, two draws and three defeats. Hertha coach Pal Dardai has never beaten Dortmund in the Bundesliga. As a player he only managed three draws and five defeats; as a coach he has lost once. Julian Weigl covered more ground than any of his BVB team-mates in the side’s first two Bundesliga matches (11.7 kilometres and 11.1 km). He also misplaced fewer passes than any other Dortmund player (five per cent and 12 per cent).